An okay anime film with some cool visuals, but a way too simple story. Ponyo is an animated movie by hayao Miyazaki, a man who is probably the greatest anime director of all time. miyazaki is japanese and his anime films are always creative and visually stunning. His best movies are princess mononoke and spirited away. before those two he made castle in the sky which was a little too silly with a mom and her goofy ogre sons. but princess mononoke and spirited away felt like they got serious, even with the talking wolves and strange ghost like spirits. Following these two great movies, miyazaki made howl’s moving castle, which was a little too complicated for its own good, with a strange time portal wheel. the movie had the good sense to cast billy crystal as a flame of fire, but it wasn’t enough to make up for the overly complex plot. Ponyo has the opposite problem. the story is very basic and simple, as if more for a child than for an adult. the premise is that a boy finds a goldfish that washed up on the shore and takes it home with him in a jar. he names it Ponyo and feeds it ham and the boy loves his goldfish. but one day the goldfishes father, a strange man voiced by liam neeson, who lives in the sea, comes looking for him and takes him back. only Ponyo doesn’t want to go back. he loved living with the boy and wanted to stay there. the boy misses Ponyo too. and one day while he is out driving with his mom, a huge hurricane hits, causing massive waves to rise up. the boy looks out the window and sees a little girl running on the waves. the girl is Ponyo. she has grown legs and arms. she has changed to look like a person. the legs and arms look strange, like twigs, but they still make her look like a real girl and that’s exactly what the boy tells his mom that he sees out the car window. they stop the car and go looking for her and when they find her, the boy and his mother take her home. it isn’t long before the boy realizes that the girl is actually Ponyo, his long lost goldfish. 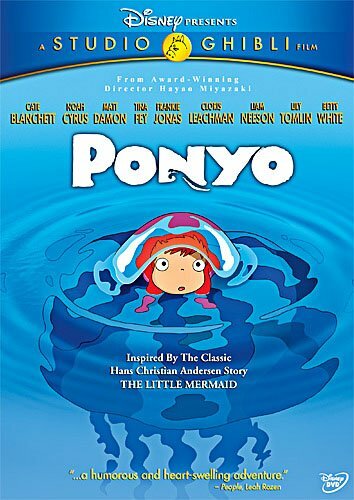 meanwhile, down below the sea, the father (liam neeson’s character) calls for a meeting with Ponyo’s mother, a sort of floating sea spirit, voiced by cate blanchet. 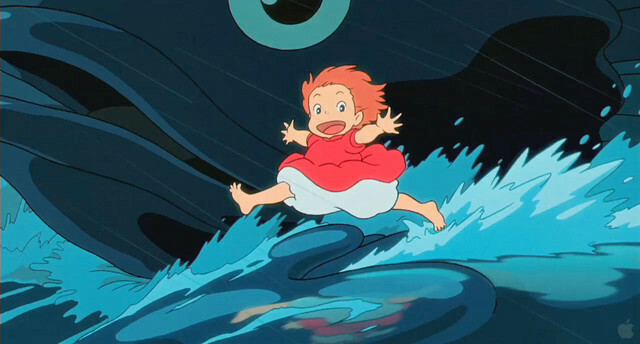 she shows up, carried along by the floating water, and tells the father that he needs to let Ponyo go. and now we come to the final part of the movie, and this is where it gets the most strange. the mom was volunteering at an old age home while the hurricane was happening, and somehow the whole place ended up underwater. the boy goes to find her there and in doing so, finds a kind of place where he can live with Ponyo. I don’t quite get this ending at all, but if i remember correctly from spirited away, this director likes to make a lot of things that one has to think about and figure out and that don’t make sense the first time you see them. as is always the case with miyazaki’s movies, the animation is state of the art. there are amazing shots underwater, and having the waves be represented by giant fish who just pile on top of each other as they swim is extremely artistic and maybe even poetic. when the waves start coming all together, they look exactly like real waves, only they have eye-balls opening on the sides of them. there are some great actors voicing roles in this movie. 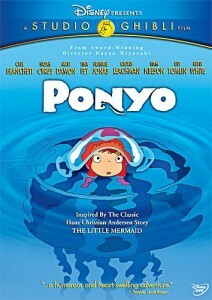 liam neeson and cate blanchett do a nice job as the voices of Ponyo’s parents. especially neeson, who is completely distressed over the loss of his daughter. and then there’s matt damon, also in a smaller role, as the boy’s father who is always out at sea. i liked the scene where the boy saw his father’s ship all the way out there and ran to a morse code light and then relayed a message on it that got sent out over the night sky to his father. and the father used morse code lighting to respond back. the plot really is simple, with a little boy finding a pet goldfish and bringing it home. the animation, too, is not quite as lively or fantasy-like as most of miyazaki’s films. that’s because so much of the movie takes place above the surface, in the boring every day life of humans. the stuff that happens under the water is all fantastic. i got a little bit of a little mermaid flashback with this premise, about a guy who lives in the sea, but really wants to live on the land and mix in with the humans. just like the little mermaid, he wants it so badly that he starts to turn into a human. I really liked the father of the sea and thought he was an interesting character. especially when he went around with a sort of pesticide can, spraying everything in the neighborhood, looking for a way to get Ponyo back. and the premise, simple as it was, started to really feel like a mizaki film by the end. that’s because, just like in spirited away when the little kids had to go into this mysterious world looking for their parents, in Ponyo, by the end, the boy’s mom has disappeared and he had to go and find her too. and in order to do that, he had to go into a strange and surreal world. Ponyo is an enjoyable movie mostly for it’s animation. the waves and sea life are just exceptional. the premise is good, but simple. it’s probably the most simple of all of mizaki’s films. this is clearly done on purpose here with a basic log line that might read “ a boy finds a goldfish in the water and keeps it, making the water and sea lie unhappy with him for doing this. He and the goldfish become friends, and she wants to stay with him, but can’t.” The ending was very strange, but i prefer that to one that is so simple and neat. it’s a good movie, filled with amazing action, especially when it goes under the surface.